Temple exploration, Day 2 commence. Connie and I decided to take a day trip out of Siem Reap to visit a lesser-known, much-less touristy temple called Beng Mealea that she'd heard was amazing. We hired a tuk-tuk driver to take us there; it was about a 2-hour drive. I have to admit, one of my favorite parts was the drive itself - it took us through gorgeous Cambodian countryside, tiny little villages, rice fields, and felt like a totally different world from Siem Reap. It was like true local, rural Cambodia. A man and his field. We finally made it to Beng Mealea - it was truly out in the middle of nowhere. It's another one of those temples where nature has completely overtaken everything, and nothing has been restored. The difference is this one is super grand, a lot more off-the-beaten-path (therefore not being overrun with other tourists), and generally one of the coolest places I've ever been. The temple has the same floorplan as Angkor Wat (the largest and most famous of all the temples), but parts of it had completely fallen to ruin. There was a wooden footpath that had been constructed throughout the temple so that you could explore all the parts. Then, as we were randomly wandering, we ran into a lady - she was an employee of the temple (was wearing an official shirt and all), and she motioned for us to climb over the fence and leave the footpath/trail entirely. So we did. It was insane. She literally led us down these crazy rock piles, then proceeded to take us on a ridiculous temple adventure. We were basically climbing over huge piles of ruins, tunneling us in and out of broken windows, following small dark passageways inside the actual temple, and scaling moss-covered rocks. It was like a video game. And it definitely felt completely unauthorized - we were not anywhere on or near the constructed path you were supposed to stay on (but the lady was a park official, so we didn't know what was happening). After a sweaty personal version of Tomb Raider, the lady eventually led us back to the set footpath. And demanded $5. Ahhh, now it all made sense. 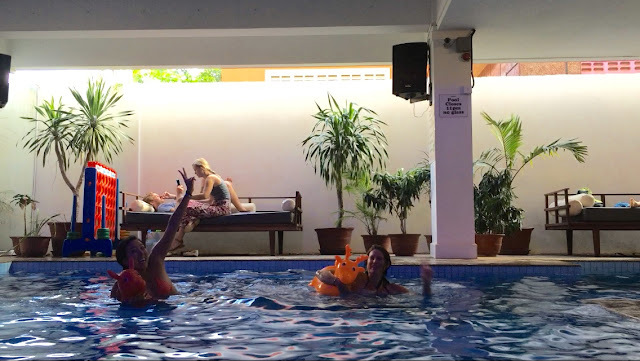 $5 is actually a lot of money in Cambodia, but Connie and I both agreed it was completely worth it. It was seriously one of the coolest things I've ever done - and I don't think this is something park officials will be able to get by with in 10, 15 years. It just felt completely unexplored and wild. It's so crazy because right near these awe-inspiring, amazing temples and pieces of history are people just living everyday life. Like 20 feet outside, there were a bunch of farm kids and cows running around. 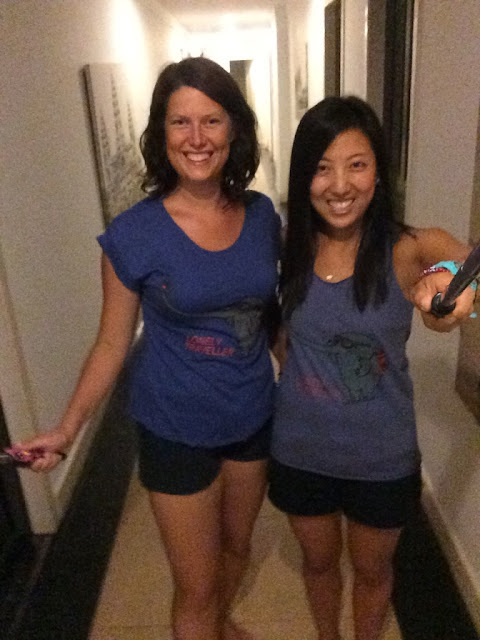 Then we braved a monsoon to go to the night market and purchase these matching shirts. They are the CUTEST - it's an elephant with a backpack taking a selfie with his trunk with the words "Lonely Traveller" on it. Last night of my SE Asian extravaganza - so, so sad! We went to bed early, however, in order to get up in the super super early morning to go watch the sunrise over Angkor Wat. Is that Johnny Walker Black Label on the bottom row? He explained that Cambodia is super corrupt and gas prices are controlled by the government and are really high - therefore, tons of people smuggle gas from other countries themselves. And then sell it out of their homes in random displays like this, using very random bottles. This person had an inordinate amount of empty Johnny Walker bottles. But you do see these everywhere. I <3 Cambodia! The countryside there is truly amazing, right? I kept calling it Big Sky Country when I was there (Mintana won't mind). So glad you got to go to Angkor Watt!